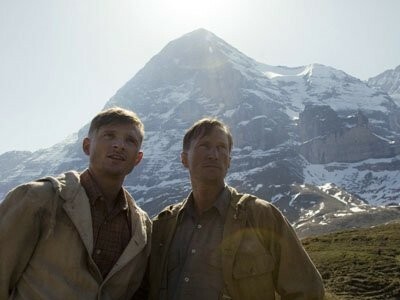 Show: North Face Writer-director Philipp Stölzl dramatizes the 1936 attempt of four climbers to scale the deadly north face of Mount Eiger in the Swiss Alps, and the result is terrifically suspenseful even if one already knows the outcome. See our in-depth North Face review for more. Dinner: Mixteco Grill "Based on the name and the looks of the place, you might take Mixteco Grill for a nicer-than-normal diner, acceptable if unambitious. Don’t be fooled: this is a restaurant set on greatness. The menu is pan-Mexican, featuring Oaxacan moles, Pueblan salsas, Guerrerense meats, and other regional specialties," writes David Hammond. The cochinita pibil made our list of the best Chicago dishes of 2009. Show: The Wedding Song During the Nazi occupation of Tunisia, two young women find their friendship stretched to its limits by the desires of men and the demands of war, which can be hard to differentiate. Dinner: Xoco "Caldos, served only after 3 PM, are all more than meals in themselves, deep and substantial soups brimming with the same sort of meats available on the tortas but also vegetables, chile, avocado, and lime and maybe noodles or dumplings to boot," writes Mike Sula. Show: Akram Khan Company Bahok by Akram Khan, a British choreographer of Indian descent, is a spare, beautiful, accessible mix of dance, physical theater, and spoken texts exploring the concept of home. Dinner: Silver Spoon "Even standards like panang curry are done with respect, full of lightly sauced cuts of tender beef flank instead of the canned-curry-drowned shreds of rawhide you get most places. Silver Spoon is one of a handful of local restaurants that will honor requests from non-Thais for food made 'pet-pet,' or Thai spicy," writes Mike Sula. Show: Free Show with Abby Sher Second City alum Abby Sher presents a free performance in honor of National Eating Disorder Awareness Week. Sher and other Second City alumni will act out scenes based on her 2009 book, Amen, Amen, Amen: Memoir of a Girl Who Couldn't Stop Praying (Among Other Things), in which she discusses overcoming an eating disorder. Cocktails and hors d'oeuvres will be available, and a raffle follows. Dinner: Fiorentino's Cucina Italiana "Fiorentino's is truly a family-run restaurant: Signora Fiorentino rushed to greet us when we walked in, stopped by frequently, and saw us to the door as we were leaving, always ready to talk about food. Sicilian, she's dreamed up a menu that tends toward seafood and dishes that show a restrained hand when it comes to sauce and spices," writes David Hammond. Show: Windy City Story Slam The All-City Championships, with finalists Alex Bonner, Fernando Hernandez, Nicolette Kittinger, Maggie Ritchie, and Alexis Thomas, and "special guests" 2009 National Book Award finalist Bonnie Jo Campbell (American Salvage), John Hemingway (Strange Tribe: A Family Memoir), Columbia College fiction writing professor emeritus John Schultz, and Ben Evans. Musical guest: White Mystery. Dinner: Birchwood Kitchen "There’s not a cheap shortcut to be found at this ambitious sandwich shop from former Pastoral cheeseman Daniel Sirko and partner Judd Murphy (also of Pastoral). Like every new venture these days it invokes the mantra of local, seasonal, and sustainable. But here those words have real meaning, with ingredients on the menu of hot and cold sandwiches--plus a make-your-own option with house-roasted meats (turkey, ham, beef)--largely sourced in the midwest and served on Labriola and Red Hen breads," writes Mike Sula. Show: Questionable Scarf Party A spin on the "ugly sweater" party theme, this event includes drink specials and prizes for patrons who wear their "most ridiculous, loudest, ugliest, most outlandish, and most questionable" scarves. Dinner: Cuna "A bustling barstaurant isn’t my idea of the best place to savor sophisticated contemporary cuisine, but Cuna, the first nightlife venture from local businessman Paolo Acuna, has a friendly neighborhood vibe, thanks in part to the unpretentious staff," writes Anne Spiselman.